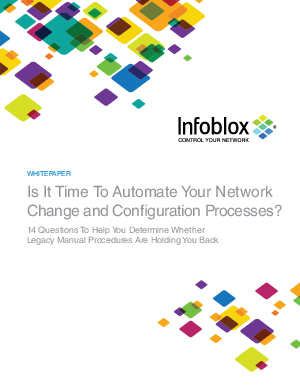 > Infoblox > Is it Time to Automate Your Network Change & Configuration Processes? Networks are becoming ever more critical to business success. Most IT and network managers are painfully aware that legacy manual processes are a roadblock in delivering new services in a timely manner. Automation tools are currently available to network teams, but most still use legacy techniques and tools to manage their network. As the growth in complexity outpaces the increase in resources, it is more difficult each day to keep up with demanding tasks. Read this white paper to learn how network automation can help organizations gain better visibility into their network as well as automatically detect, track and archive change and configuration. Compliance can be an ongoing process and changes can be provisioned quickly and accurately by implementing network automation. The cost of network management is rising. Organizations can no longer afford to continue operating with manual processes and outdated tools.